So, let’s talk about Baby’s Breath, also known as gypsophilia. Ever since I opened my floral studio I had a healthy disdain for Baby’s Breath, much like some people strongly dislike carnations. I refer to carnations as “the red headed step child” of the flower world. (I feel very comfortable saying that, as I am a red head). So back in 2013 when my niece was getting married we were discussing centerpieces and a variety of table scapes, when Baby’s Breath made her way into the conversation. 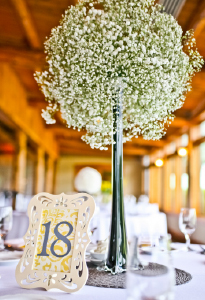 To my surprise Corey, said “I LOVE BABY’S BREATH!” Well, that’s when I had to revisit my relationship with Baby’s Breath, which resulted in what you see here! And ever since then, my relationship with Baby’s Breath has evolved in a pretty healthy one. For one, she is very user friendly when it comes to budget, a “big bang for your buck,” so to speak. 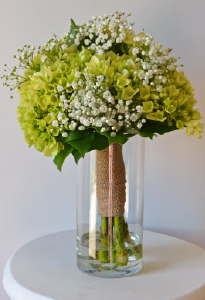 She looks great in large volumes and when used with discretion with other flowers, she adds lovely nuance.